Prakash Nanda asks: Is SP Tyagi's arrest meant to shield more powerful people in AgustaWestland scam? 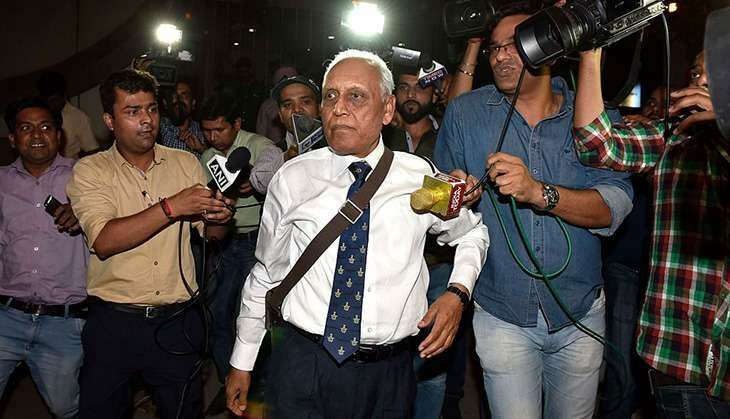 Former Air Chief Marshal SP Tyagi has the notorious distinction of being the first chief of a military service to be arrested by the CBI for his alleged corrupt deals when in office. But will he really be proved guilty by court? His reputation as one of India's finest fighter pilots has been tarnished badly by the CBI, but he may redeem his honour in court if his defence in the case is taken to logical conclusion. As it is, the CBI has a very poor rate of conviction of cases it presents in court. And one of the reasons for this is the theory that more often than not it behaves as a "caged parrot" of the government of the day. It is said that in many a case the CBI is ordered to intervene to serve the political objective of the government (favouring its friend and punishing its enemy), irrespective of the genuineness (or lack of it) of the charges. In the case of Tyagi, the charges are that the former Air Chief tweaked the qualifying criteria in favour of AgustaWestland helicopters (manufactured by Finmeccanica), 12 of which the Indian authorities agreed to purchase at 560 million euros (Rs 3,600 crore) for ferrying VVIP such as the president and the prime minister. But these charges raise more questions than answers. Also Read: Ex-Air chief SP Tyagi arrested in AgustaWestland scam. Are netas next? There are three major stages to the government buying a military product, indigenous or foreign. First, the product being considered must meet the qualifying criteria, called quality requirements, or QRS. The second is the evaluation stage during which the qualified product is tested for quality by a combination of performance benchmarks. In the third stage, the pricing and after-sale service factors are taken into consideration. And it is after the third stage that the deal or agreement to purchase is inked by the government. If the stages mentioned above are taken into account, Tyagi doesn't seem to have had a major role to play as the Air Chief. Because when the QRs were recommended to be revised by the Prime Minister's Office - on 22 December 2003 - the Air Chief was S Krishnaswamy. Tyagi took over as the chief of the IAF only on 31 December 2004, and retired on 31 March 2007. The competitive evaluations of the two shortlisted contenders were done during the tenure of Fali H Major, while contract signature for Contract No. HQ/S96062/6/ASR was done in 2010 when PV Naik was the CAS. Some of these other details will make things clearer. In 1999, the IAF proposed to replace the then Mi-8T helicopters used for VVIP transport because of their inability to operate at night, in adverse weather and at altitudes above 2,000 metres. Consequently, a global Request for Proposals (RFP) was issued in March 2002 to which four equipment manufacturers (OEMs) responded - AgustaWestland, Eurocopter SA, Rosoboronexport State Corp and Sikorsky Helicopters. The IAF's Technical Evaluation Committee (TEC) shortlisted three helicopters and, accordingly, competitive flight evaluations were conducted. Since AgustaWestland's AW-101 wasn't certified for flying above 6,000 metres, it did not participate in the flight evaluations. Russia's Mi-172 could not comply with the seven mandatory Operational Requirements (ORs). After flight evaluations, only Eurocopter's EC-225 was found suitable for acquisition. On 19 November 2003, a meeting on this issue was convened by Brajesh Mishra, the then National Security Adviser to Prime Minister Atal Behari Vajpayee. In this meeting, Mishra had observed that his main concern was that the framing of the mandatory ORs had led India effectively into a single vendor situation. It was also noted that rarely have India's presidents or prime ministers have made visits to places that required flying above an altitude of 4,500 metres. It was, therefore, decided to revise the mandatory OR for operational altitude to 4,500 metres. The flying ceiling of 6,000 metres, and the mandated internal cabin height of 1.8 metres could be made "desirable", not essential ORs. In fact, Mishra suggested that the cabin heights should be increased to better suit the tall security personnel of the VVIPs who are supposed to stand all the time. Later, a letter dated 23 December 2003 was sent by Mishra to the then IAF chief S Krishnaswamy stating that it was unfortunate that neither the PMO nor the Special Protection Group (SPG) was consulted while framing these mandatory ORs. Mishra suggested that the CAS and the defence secretary may jointly review the matter to draw up realistic mandatory ORs satisfying operational, security and convenience requirements of VVIPs, and also set in motion a fast-track process for selection and acquisition of the replacement helicopters. In pursuance of this directive, the ORs were deliberated at length between the IAF, NSA, SPG and defence ministry between March 2005 and September 2006, and the indicated changes were incorporated. No ambiguity is thus possible: the decision to lower the service ceiling requirement was official and above-board. It was taken at a meeting chaired by the prime minister's principal secretary and NSA - this time it was MK Narayanan - and was followed up in writing with the IAF chief and reviewed by the then defence secretary. Subsequently, the revised ORs were deliberated at length for 18 months by the SPG and IAF authorities before becoming effective, and were all included in the final RFP document. The acceptance of necessity for the procurement of 12 VVIP helicopters was accorded by the Defence Acquisition Council (DAC) under the 'buy' category with 30% industrial offsets on 3 January 2006. It is thus obvious that the decision to change the QR parameters was not of Tyagi. Even if one glosses over the prevailing practice of the number two in each of our three services being actually the person who gives the "go ahead" before any acquisition proposal pertaining to his respective service is sent to the defence minister (the chief only endorses the proposal), the fact remains that the decision to change the QRs in the Augusta case was taken by two governments (Vajpayee's NDA and Manmohan Singh's UPA), two PMOs (of Vajpayee and Singh), two NSAs (Misra and Narayanan) and two defence ministers (George Fernandes and Pranab Mukherjee). As the then CAS, Tyagi only carried out the order. Then, how can he be held accountableas the CBI has done? In fact, if at all there is a stronger case that can be made against the IAF, it is its subsequent consent for conducting the field evaluation trials (FET) in the UK and the US and not in the Indian conditions as is the norm. It may be noted that a team comprising officials of the IAF and SPG carried out FET of AW-101(Augusta) in the UK and of the S-92 in the US from 16 January 2008 until 19 February 2008. The FET team submitted its report in April 2008 and recommended the AW-101 for service induction. The IAF's own internal Staff Evaluation Report concluded that the S-92 (Sikorsky) was non-compliant with respect to four staff qualitative requirements (SQR) - absence of a missile approach warning system, service ceiling of 4.5km, deficient drift-down altitude, deficient hover-out-of-ground-effect parameters. Interestingly, the CBI has not deemed it fit to talk to the man who knows the most about the AgustaWestland deal - the current Comptroller and Auditor General of India Shashi Kant Sharma. He has been witness to the entire process from the outset. Sharma belongs to the 1976 batch of IAS and came to the defence ministry in mid-2003 as Joint Secretary (Air). He was the person who initiated the AgustaWestland purchase and became DG (Acquisition) in mid-2007. He held this crucial post till 2010 and served as defence secretary from March 2011 to May 2013. In fact, when he was appointed CAG by the Manmohan Singh government, many eyebrows were raised as it is unusual for a defence secretary to become the CAG, the country's apex auditor whose major auditing work involves the government's biggest spender, the defence ministry. Is then Tyagi's arrest a cover-up operation to shield more powerful people in the political and bureaucratic circles who actually clinched the controversial deal? After all, when the deal was eventually inked, it involved even the prime minister of the day as the head of the cabinet committee which gives the go-ahead for all major defence purchases. And we all know that the then prime minister Manmohan Singh was not the real source of authority in the country. In fact, Tyagi's arrest is all the more strange as none other than the incumbent defence minister Manohar Parrikar had promised in Parliament last May that his government would catch the "big fish" in the AgustaWestland scam. Tyagi certainly is not that "big fish". TWEET THIS SP Tyagi isn't really the 'big fish' in the AgustaWestland scam. Here's why Prakash Nanda asks: Is SP Tyagi's arrest meant to shield more powerful people in AgustaWestland scam?